One of the great good for­tunes of my life is that I’ve man­aged to cre­ate a pro­fes­sion­al life that requires I read a lot. Read­ing is a pas­sion; the old bumper stick­er says it all: I’d rather be read­ing. 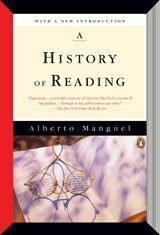 Alber­to Manguel’s A His­to­ry of Read­ing has answers to most of those ques­tions, and it pos­es and answers a great many more. Though won­der­ful­ly illus­trat­ed, the book is text-heavy, and it’s writ­ten for read­ers with some knowl­edge of world his­to­ry. In oth­er words, tough going for young read­ers. How­ev­er, the his­to­ry Manguel weaves is chock full of gems that could enter­tain and intrigue read­ers of any age if care­ful­ly culled and pre­sent­ed. Also of imme­di­ate val­ue are the exam­ples of the many depic­tions of read­ing in visu­al art through the ages, a list of which could pro­vide a good start for a moti­vat­ed young researcher. The evo­lu­tion of read­ing and its influ­ence on indi­vid­u­als and soci­eties pro­vides a won­der­ful angle for study­ing his­to­ry. But if that doesn’t work for your young read­ers, there’s always Manguel’s ear­li­er book: The Dic­tio­nary of Imag­i­nary Places, a com­pre­hen­sive and cel­e­bra­to­ry cat­a­logue of fan­ta­sy set­tings from world lit­er­a­ture. A native of Argenti­na, Alber­to Manguel now lives in Cana­da. We are so lucky in Min­neso­ta to have so many resources for read­ers and writ­ers. Thank you for your part in Bookol­o­gy. I enjoy the arti­cles. Where can I get a bumper stick­er that says I’D RATHER BE READING ? Thanks for your kind words about Bookol­o­gy, Nor­ma. As for the bumper­stick­ers, I’ve seen them about but nev­er actu­al­ly got­ten my hand on a new one.